I have just spent 10 days in the house, sanding back windows, chipping out the old window putty (which was either very old or very badly done or both), re-puttying and painting. 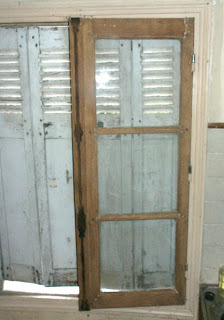 The window frames themselves are oak and really nicely made, painted in cream paint (lead based, naturally) about 30 years ago. The paint has set like rock, and was only removable by the application of industrial quantities of paint stripper and use of one of those nylon wheel attachment thingies (that's your actual technical term, folks) on an electric drill. Once the oak grain started to appear I was tempted to varnish rather than paint, but at some times in the past they have been sanded back with a disk sander, which has marked them quite badly. They have now been reputtied (except where I broke the 2mm "thick" glass) and undercoated, and hopefully next week I will be finishing the painting. At some stage I will have to get a couple of cracked panes replaced, but it's August and the glazier - along with everyone else - is on holiday. There were no excursions, unless you count visiting hardware stores. 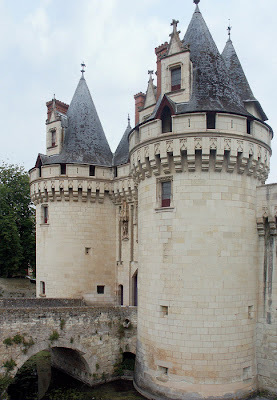 I know very little about the chateau at Dissay - I didn't know it existed until I saw it on the Survol de France website. I do know that I will make the time to visit it. Back in the day, in Canberra, I received an education. Some of those who know me may find that difficult to believe. Luckily, some of the teachers I had were very good teachers, and equally good people. One of those is "Uncle Ricky" Sutton. Rick and Helen are on their now annual jaunt around Europe, and joined us in Preuilly to have a look at the house, view the surroundings, and help with builderly stuff. After catching the first ferry of the day to Boulogne-sur-Mer and driving to Preuilly, I returned to Chatellerault just in time to meet them off the train. They were booked in to l'Image and I was camping in the front room of the house. We shopped for salad and flambouyantly healthy desert (well - there WAS fruit on it! ), and after dinner had a wander up to the chateau. Next morning was market day, so I shopped for Thursday's dinner while Rick and Helen slept off their train-lag. After meeting up for breakfast we returned to the market, where Helen indulged in a stone fruit and berry shopping frenzy. The peaches have been really good this year, and we also bought Reine Claudes (greengages) that were the juiciest, sweetest (and yet with just a hint of sour) plums I have ever eaten. Magnificent! After lunch we drove to Poitiers to pick up Susan, travelling via Bonneil-Matours, which was looking it's usual picturesque self. 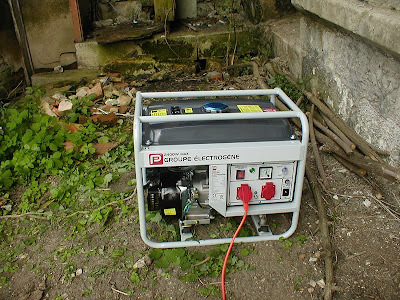 We called in at Castorama and bought a 2400w generator (groupe électrogène) so that the growing range of power tools can be used. I was slightly worried that a trailer would have to be bought to transport the generator, but luckily it fitted nicely into the boot. So now we have some power. Rock and and Roll!! Our main excursion this trip was to the Brenne to meet up with Tony Williams (warden) and have a wander around some of the areas of the park not usually open to visitors. Susan understood more of what was happening there than I did (me being a bit plebby when it comes to insects) but it was interesting seeing some habitats we hadn't seen before. We all appreciated the quiet and it must be said it does have a certain beauty to it. 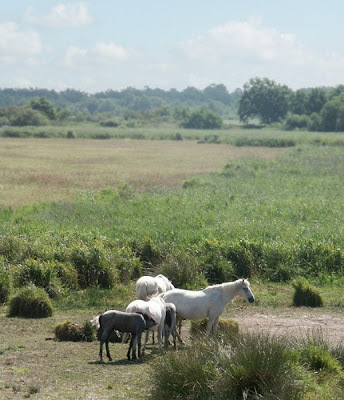 There are some Camargue horses on the reserve as well, which add a slightly exotic (to my eyes, anyway) feeling to the place. After walking the reserve, we adjourned for lunch at the Auberge La Gabrière. We had been there before but now it is summer, all the tables are out the front under umbrellas with a view of the lake. 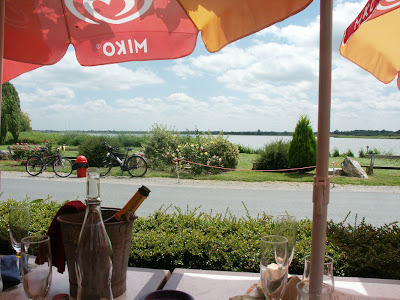 We had one of the best lunches possible - a 12 euro menu and a bottle of Creamant du Loir - all served by charming (if very young) waitresses and with a view. If it is a meal that can be improved upon, I am not quite sure how. Our other excursion was taking Susan back to the airport. 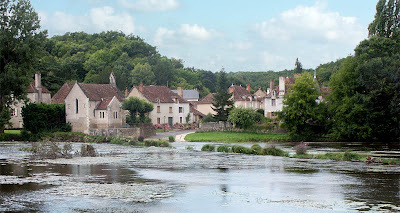 We went via Angles sur l'Anglin, where we picnicked, and then to St Pierre de Maille which is another very pretty village by a river.After that we went to the church Notre-Dame-la-Grande at Poitiers I had visited with my parents in June. After Susan had left we went to Dissay to find the Chateau, which is most attractive. Unfortunately we were too late to visit, but next time I will allow time. 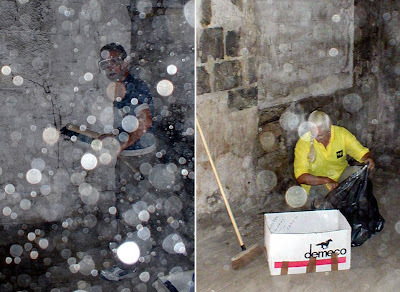 The only other notable event was visiting the showroom/workshops of M. Chaboisson, who we hope will be building our staircases, Having had a look at his work, I think we will see if we can afford to have him do our windows in the granary as well. Rick, Helen and I travelled back by car, having an uneventful trip (apart from me rejoining the autoroute heading in the wrong direction at Alençon). The ferry crossing was probably the smoothest I have experienced - which this year is really saying something! After the staircase had it's "ceased to function" episode I went to the joiners to arrange for a quote. I worked out what I was going to say before arriving. "Je ne parle pas d'anglais"was the reply.